With all the long ocean passages of our journey across the Pacific, one has a lot, and I do mean a lot, of time to think. Recently on passages, as I contemplate turning the ripe old age of 30, I have come to wonder, how is it that I managed to find myself in the middle of the Pacific, on this extraordinary journey. In this entry, I want to take a look back at some noteworthy turning points and people that I believe played a big role in where I am today. 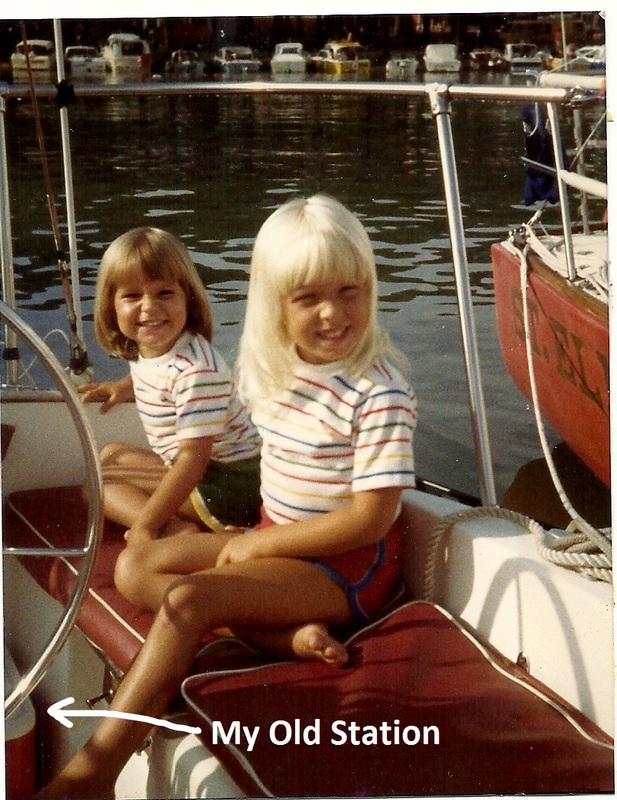 Some may suggest that I was groomed from a young age to be a sailor. Just out of frame, to bottom left of the picture below, you can see my old station aboard my Dad's sailing boats… the cooler. Unfortunately my days as a cooler jockey came to an end when I was two years old, and I don't have any memory of them, but who's to say it didn't light a fuse? My sisters Mandy and Melanie aboard my Dad's sailboat. The cooler acted as my playpen back then. For those of you who didn't know me when I was young, I'm sorry to admit I was a bit of delinquent. I suppose no more than any other pre-teen boy. Needless to say school was just a place to go hang out with friends and get into trouble. Something changed though around the seventh or eighth grade. Around this time my grandpa Raymond Pollard took me aside and said, "You are a strong, smart young boy. The Pollard blood courses through your veins." My Grandpa took numerous trips to the far east and Africa in the 1960's and 1970's, back when it was much less common to do so. There must be something in that Pollard blood, a thirst for adventure and far flung paces, not to mention the passion and determination to make things happen. Maybe he saw something in me way back then, something that I hadn't seen yet in myself. In the years following that talk, my grades continually improved as I got my act together in high school. 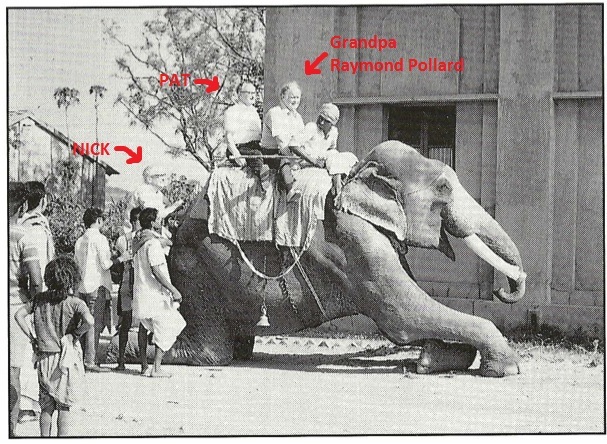 My Grandpa's brothers, Nick and Pat, board an elephant with him in India 1973. Throughout high school I worked at Pollard Bro's Calcium Products and on my Uncle Larry and Aunt Marcia's farm on the 3rd concession. I was always eager to work at the farm and drive the tractors, but I didn't weigh enough to keep the dead-man switches activated on the tractor seats until the summer before high school. Working at Uncle Larry's was definitely a step up from the previous summers of potato farming and corn packing. On one noteworthy summer day, Uncle Larry borrowed about a dozen Mexican migrant works from Lonsberry Farms to dig a trench through the duck habitat we had been building down by the pond. The best part was I got to supervise them! If only my Spanish was as good back then as it is now after cruising for a year in Mexico, things may have went a lot smoother. Throughout the years there I learned a great number of skills which I still use to this day. Problem solving, improvising fixes, welding, the list goes on and on. But perhaps most importantly I developed a strong work ethic, that has been the backbone of my success in school and work. Uncle Larry, further proof of the Pollard blood thirst for adventure, passion and determination. Another big influence on me in high school was my teacher, mentor and friend Rolf Martens. Through his guidance I found my way into the Waterloo Coop program for Computer Engineering. The coop program in my opinion was critical in making this journey happen, since it allowed me to leave school debt free, and with a great job. 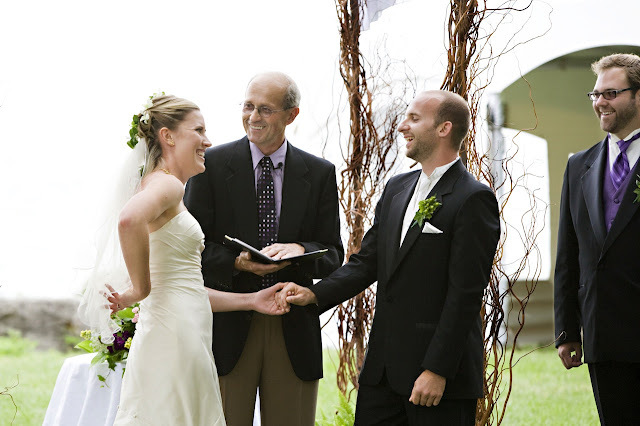 A few years back Anne-Marie and I were honored to have Rolf officiate our wedding ceremony in Harrow on Lake Erie. After moving to San Francisco for work, the idea of living aboard a boat continued to grow in my mind. At first it seemed like a fun and lower cost way to live in the San Francisco Bay area (Note: the lower cost part didn't really pan out in the end, once you figure in outfitting the boat for cruising and 2 years off of work). Once I got into the life aboard lifestyle, and talking to fellow sailors, visions of a longer journey started to develop. None of that would have happened without the support of my parents, Herb and Michelle, who lent me the money for my first boat, despite their better judgement I would imagine. Herb and Michelle enjoying the view from Starship in beautiful Banderas Bay Mexico. Last, but certainly far from least, having a very adventurous wife Anne-Marie willing to buy into this crazy idea was essential! Anne-Marie has embraced the cruising life to a degree which I believe few cruising wives aspire. She insists on being able to do all sailing operations on her own, and in that sense is a true "Co-Captain". Anne-Marie is also the head of plumbing (a title few women are so eager to embrace, especially when a complete redesign of the head systems was scheduled), provisioning and route research. There have been many ups and downs on this journey, but one thing is for certain, we will look back on it fondly for the rest of our days together. Anne-Marie goes up the mast! Anne-Marie drilling backing plates for deck hardware. Anne-Marie showing off her double braid eye spicing skills. Anne-Marie and I having a good time.